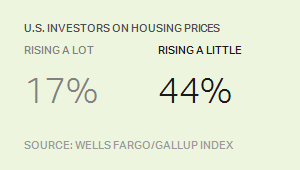 WASHINGTON, D.C. -- Roughly six in 10 U.S. investors say housing prices in their area are rising. Just 11% say prices are falling, while a quarter believe prices are stable. These data are from the third-quarter Wells Fargo/Gallup Investor and Retirement Optimism Index survey, conducted Aug. 7-16. Investors are defined for this survey as U.S. adults who have at least $10,000 invested in stocks, bonds or mutual funds, a criterion met by 44% of U.S. adults in the current survey. The large majority of these investors own homes (83%) while a much smaller figure rent (15%). In April, Gallup found thatmost Americans expected local housing prices to increase. Among all investors who perceive that local housing prices are rising, sentiment is mixed about how increasing prices are affecting their personal financial outlook. 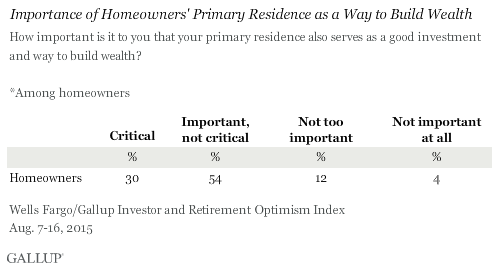 About half say rising housing prices make them feel no differently about their discretionary spending or investing in the stock market, while about a third say they are more optimistic about their spending and investments. 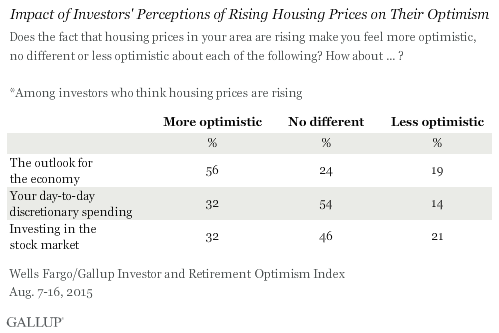 On the other hand, 56% say rising housing prices make them more optimistic about the economy's outlook, with 24% saying they make no difference. The vast majority of investors who own their homes see owning property as "important" or "critical" to building wealth. Neither the size of one's investments nor an investor's age appears to influence how a home-owning investor values his or her primary residence as a means of building wealth. A significant majority of investors of varying ages and portfolio sizes see owning property as a way to build wealth. 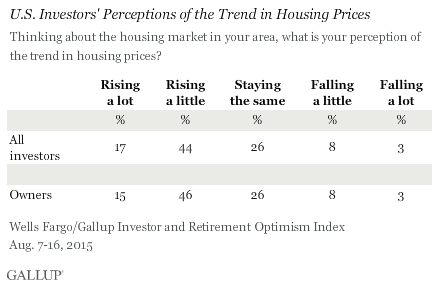 And most investors perceive that housing prices are going up. However, few say that these price increases are having a real effect on their own day-to-day spending or investments. Instead, the majority of investors who are seeing housing prices increase in their local market say these increases are making them more optimistic about the outlook for the economy. 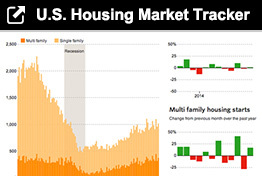 Recent indicators released about the strength of the housing market have been all over the map. In some cases, quite literally. Most cities east of the Mississippi River—from Chicago to Miami—saw home prices drop between June and July, according to the S&P/Case-Shiller Home Price Index. Meanwhile, most metropolitan areas west of that dividing line, from Portland to Las Vegas, saw home prices rise over the month. Geographic divides help explain the unevenness in the housing market’s performance in recent months. Prices have continued rising, even as the pace of existing-homes sales tumbled in August. New-home sales hit their highest level since early 2008 in August, but forward-looking indicators of the strength of the housing market have also been weak. Economists say that getting a clear read on the housing market has become difficult as local markets are performing very differently. The dividing line between the haves and have nots, in a word: jobs. Local areas especially with strong technology sectors are seeing prices rise rapidly, while many former industrial cities in the Northeast have slumped. Chicago saw prices decline 1.2%. Even New York City and its suburbs saw a seasonally adjusted decline in prices of 0.5%, likely driven by declining interest in living in single-family homes on Long Island and in Westchester. Meanwhile, San Diego saw prices rise 0.8% seasonally adjusted, while in Las Vegas they rose 0.4%. “These conflicting trends may be confusing and even frustrating for some, but right now they shouldn’t be too much cause for concern. The market is continuing to heal and find its footing in a new environment, one where highly local factors [including jobs] matter more in local markets than national trends,” saidSvenja Gudell, chief economist at Zillow. Indeed, over time the divide between California cities and some of their Rustbelt counterparts becomes even more apparent. Home prices in Los Angeles, San Francisco and San Diego have more than doubled since January 2000. 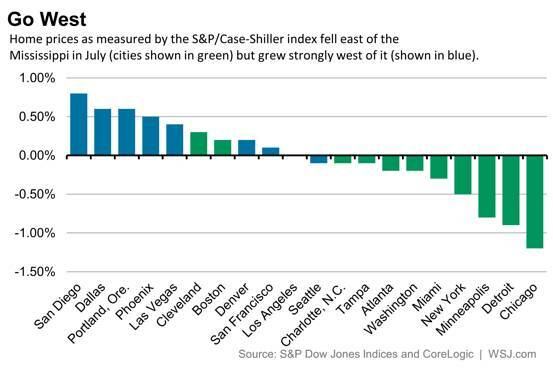 In Detroit they have grown just 3% since then, and in Cleveland just 10%, according to Case Shiller. “A good deal of the economic recovery is tied to technology and technology stocks, which until China were doing reasonably well,” said David Blitzer, managing director and chairman of the index committee at S&P Dow Jones Indices. Nonetheless, Mr. Blitzer warned that the California economy could struggle if the Chinese economy continues to stutter because it relies significantly on trade with Asia. That could eventually have an impact on home prices in the West. Even though the market has recovered from near-historic low mortgage interest rates, it’s still a great time to become a homeowner. Whether you’re considering buying a property to live in or one to rent out, the time is now. According to Bankrate.com, current interest rates for a 15-year fixed mortgage hover around 3.2%. Barely surpassing inflation, this rate also allows current homeowners to refinance their loans or to put extra money toward their retirement accounts instead of paying off their mortgage early. If you’re looking to get a mortgage right now, make sure your credit report is in top shape. Review it to see if there are inaccuracies — you want to be prepared to get the best interest rate possible. Check out a few different lenders; you never know which one will be able to get you the best rate. Will Lipovsky, a blogger at First Quarter Finance, said since interest rates for mortgages are still low while the stock market is doing well, now could be a perfect time to get into real estate. For some people, putting money they’ve earned into real estate could be a nice way to diversify their investments. Instead of buying more stocks or mutual funds, buying real estate can be a good way to round out a portfolio, even for a seasoned investor. Plus, there are special deductions you can take as a landlord that you don’t qualify for if you live in the home. But is Buying the Right Thing for You? If you’re considering buying a home, the time is now given outside factors. But is it a good time for you? Do you have the savings for a down payment? Do you have an emergency fund that can cover any unexpected repairs? Do you anticipate living in the same area for at least the next five years? No matter if you’re looking to become a landlord or if you want to upgrade, real estate is not one-size-fits-all. Some cities are particularly good for investors while others have few areas that are good for development. With interest rates hovering near historic lows, now is a great time to buy into the real estate market. But don't just buy just to buy — make sure you can really afford the down payment and other costs associated with purchasing a house without sacrificing everything from your savings pool.